Updated at 11:11 a.m. ET -- A dive team from the New Mexico State Police was resuming its search near the dam at Vallecito Reservoir on Monday for Dylan Redwine, a 13-year-old boy who disappeared from his father's home during a court-ordered visitation over Thanksgiving in southwestern Colorado. La Plata Co. Sherrif's Dept. According to The Durango Herald, the divers began the search Sunday in an area that cadaver dogs had flagged Saturday while aboard watercraft. No remains had been found by Monday morning. Cadaver dogs and patrols were also going out around the 12 miles of shoreline, La Plata County Sheriff’s Office spokesman Dan Bender told NBC News on Monday. "It's been devastating for the family," Bender said. Dylan was reported missing on Nov. 19 by his father, Mark, who said he left the house in Vallecito, La Plata County, about 7:30 a.m. and returned a few hours later to find his son gone. 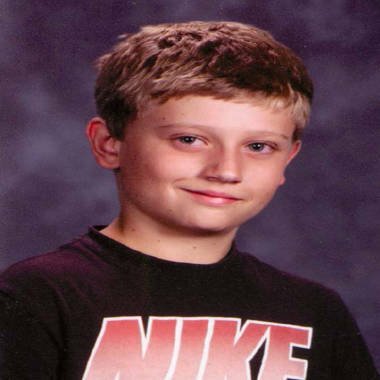 Dylan was described as 5 feet tall, 105 pounds, blond hair, blue eyes with a fair complexion. He was last seen wearing a blue and white Duke Blue Devils baseball cap, a black Nike T-shirt, black basketball shorts, black Jordan tennis shoes and a black backpack. On Saturday, about 200 volunteers and law enforcement officials went door to door in the region and searched hills near Vallecito Lake, the Denver Post said. "Every time someone sees a young male child with light hair or with a black backpack we're getting calls," Bender said, adding that there had been no confirmed sightings of Dylan. The Herald said police are also looking to speak with two boys who were seen by a postal worker on Nov. 19 at the Vallecito Lake Country Market, according to Bender. The postal worker, who knows Dylan, said one of the boys looked like him, adding that both teens were also wearing black backpacks. As of Monday morning, Bender said police had not heard from the two boys. According to a news release, the La Plata County Sheriff’s Office is “working with local representatives of the FBI to share information and resources as they continue to develop leads on where Dylan may be," The Herald reported. “Scenarios from abduction to runaway are being examined,” the release said. “Without any new clues, we have to continue to consider any and all possibilities." The FBI has not officially taken over the investigation, Bender told NBC News. Dylan, his mother and his brother had moved to Colorado Springs this summer, NBC station KUSA of Denver reported. Vallecito is more than 7,000 feet above sea level in the middle of rugged terrain. The weather in the area in the past few days has been clear and cool, with highs in the 50s and lows below freezing. Anyone with information on Dylan's whereabouts is asked to contact La Plata County Sheriff's Office investigators at 970-382-7015 or 970-382-7045.